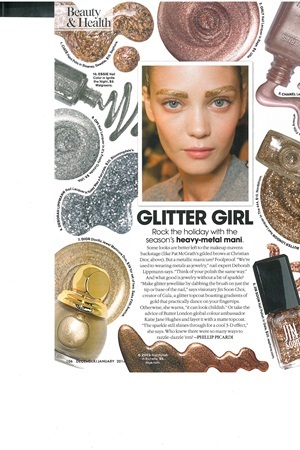 The Dec/Jan issue of Teen Vogue offers a new holiday season mani: heavy-metal. Metallic manicures can be the perfect way to add sparkle to your look. Teen Vogue suggests you can make the glitter polish jewellike by dabbing the brush on just the tip or the base of the nail. Or you can layer glitter polish with a matte topcoat, leaving a 3-D effect that sparkles. Careful not to go overboard, though, because with too much, you can risk looking childish. Colors featured: Ciaté Paint Pots in Sloaney, Orly Nail Lacquer in Rage, Chanel Le Vernis Nail Coulour in Rose Moiré, Butter London Nail Lacquer in The 444, Jin Soon Nail Polish in Gala, Zoya Nail Polish in Richelle, Dior Diorific Jewel Manicure Duo, Deborah Lippmann Nail Lacquer in Today was a Fairytale, OPI Nail Lacquer in It's Frosty Outside, and Essie Nail Color in Ignite.